If you have trouble reaching me by phone, please send me a text or an email. 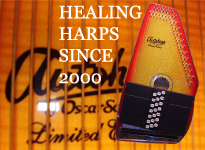 Wrap your harp in bubble-wrap or put it in the case with bubble-wrap around and above it so that it can not slide or flop around in the case. (Newspaper is also good to pack around a harp that's shipped in it's case.) Then put it in a box with enough packing peanuts or filler around it so that it can't slide or flop around in the box.